Hot tub and swim spa product specialist Aqua Warehouse Group is ramping up its promotion and supply services for the Covana cover systems due to increased demand from the wet leisure market. The thriving L.A Spas and Vita Spa distributor and exclusive supplier of the USA-manufactured End2End swim spa cover to the British market, had three state-of-the-art Covana systems on display and operational during the recent Hot Tub Living Expo; including the fully-automated Covana Legend cover system that was assembled above the new Vita Spa VL4 as part of the launch promotion for the swim spa model and its xStream Force Jet Propulsion System; and is seeking to boost sales even further with a new ordering system. Aqua Warehouse chief Richard Hart reported that his Aqua Spa Supplies division is servicing increased orders for the automated Covana covers thanks to dealers promoting the advanced security and ease of use in their showrooms. 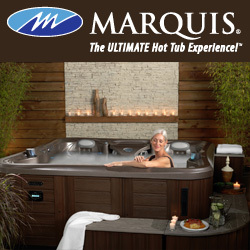 As a result, a new system is being implemented to ensure orders are processed much more efficiently with the launch of a dedicated ordering format similar to the current capability for hot tubs and swim spas. Along with the Legend, pictured, which is suitable for swim spas with rectangular or rounded ends from 3.7m to 6.1m, Aqua Spa Supplies is also heavily promoting the Covana Evolution and Covana Oasis systems for hot tub dealers to supply to their customers who are seeking an advanced user-friendly cover with high insulation value, and peace of mind security. The Covana Oasis is suitable for rectangular hot tub sizes from 2.11m to 2.36m; while the Covana Evolution is compatible with square hot tubs that are 2.11m to 2.43m; rectangular models, 2.43m x 2.74m to 2.43m x 3.35m; as well as round models up to 2.42m in diameter. Both are available with retractable shades and screens options to create advance protection from the elements as well as providing privacy for users. “We have seen a large increase in the demand for Covana systems from our growing customer base,” said Richard; “That’s why we’re putting extra resources into promoting and supplying the dedicated automated covers for hot tubs and swim spas. “To provide even greater customer satisfaction, we’ve ensured that the Covana cover models we stock now have their own dedicated ordering process like the systems we’ve already implemented for the hot tubs and swim spas from L.A Spa and Vita Spas. “These Covana covers have a high price tag but when prospective customers see them in our dealer’s showrooms they are prepared to purchase them with a hot tub or swim spa due to the fact they provide so many benefits. 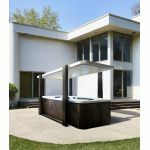 “The beauty for dealers is that they do not take up additional space, as they can be placed on display above a hot tub or swim spa.